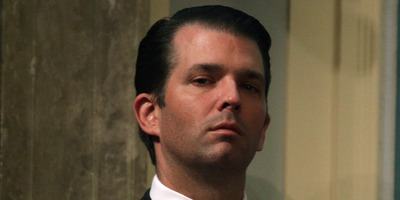 Alex Wong/Getty ImagesDonald Trump Jr.
A former Indian official accused Donald Trump Jr. of pushing an illegal project in Mumbai. The accusation comes as Trump Jr. has received scrutiny for a recent India trip. A former Indian official accused Donald Trump Jr. of pushing a “blatantly illegal” project in Mumbai. The official, Chief Minister Prithviraj Chavan, whose position is the equivalent of a US governor, said on the latest edition of ProPublica’s “Trump Inc.” podcast that Trump Jr. had asked him to overturn a decision to revoke permits for the Trump Organisation’s initial India project. Trump Jr. then travelled to India in April 2012 along with partners and met with Chavan in hopes of getting the project up and running again. Chavan was told that Trump Jr. and the partners wanted to discuss investing in his state. Instead, they asked him to overturn that earlier decision. The Trump Organisation did break into the Indian market in 2014 under a new government with the construction of Trump Tower Mumbai. That project is set to be finished in 2019 and is one of five Trump-affiliated projects being developed in the country. Just last month, Trump Jr. visited India to promote the properties. His visit came under fire by critics, particularly after national newspaper ads promised a dinner with President Donald Trump’s eldest son in exchange for an early sign-up to one of the Trump apartments under construction. ProPublica reported that a Trump partner said they booked $US15 million in sales within one day during Trump Jr.’s India visit. Each of the Trump Organisation’s India projects are licensing deals in which the company provides the Trump name and manages the property. The Trump Organisation didn’t respond to requests for comment.